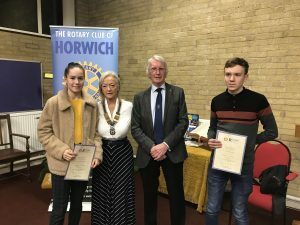 Two Junior athletes U17’s Isaac Parker and U15’s Sophie Walton attended a junior achievement awards evening in Horwich hosted by Horwich Rotary. They were with 40 other young achievers from various activities from the Horwich and Blackrod area. They both received a certificate and a £200 cheque for their achievements this year 2018 in athletics. Isaac finished 2nd in the North West rankings and runner-up in the County Championships in 400 metres and for his Long and Triple Jump. Sophie for her bronze and gold medals at English schools and her double gold at the English Nationals making her the English champion along with being her schools Sports Personality of the year at Rivington and Blackrod. Both Isaac and Sophie said they were happy and pleased to receive the awards and the money will go to buying much needed equipment for the coming season.